When news broke last week that Oracle had decided to join the 21st century and launch a cloud product in order to take on the likes of the highly successful Salesforce.com, my first was reaction was that it was about 10 years too late the game. Can a traditional enterprise software and hardware company suddenly compete in the cloud? I think not. Don’t get me wrong I find the idea of the dinosaur software and hardware company taking on the preeminent cloud computing vendor (and one of the earliest examples) to be highly entertaining. Oracle is the poster child for traditional enterprise software implementations. It is the polar opposite of what you think of when you think about cloud services. It’s complex instead of simple. It’s expensive instead of cheap. It’s hard to implement instead of easy. It requires significant resources to install, configure, maintain and manage. 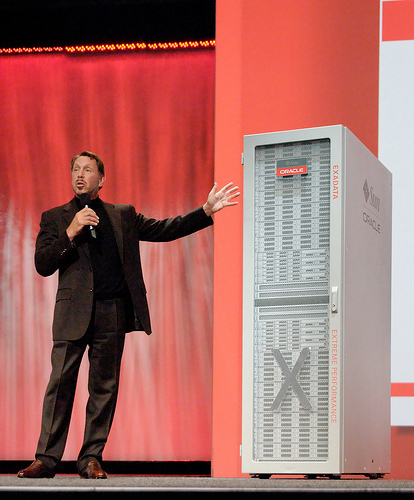 In short, it’s everything cloud is not — yet now Oracle wants to be your cloud vendor. Does anyone else see a major disconnect here? Maybe he’s evolved in 4 years. Who knows? But it’s also impossible to ignore the recent Google/Oracle patent trial around Java appeared to be a full-scale attack on cloud computing. So when that tack failed, Oracle did an about face and decided to embrace cloud computing instead (or perhaps it was just trying to clear away the competition ahead of its announcement). Brent Leary, who is co-founder and partner at CRM Essentials LLC, a CRM consulting/advisory firm focused on small and mid-size enterprises, says it’s never too late for a company the size of Oracle to take a shot. “I think we’re too early in the game to say anything that happens now is too late. But that doesn’t mean companies can wait around to make moves,” he said. True enough, but can a company built as a traditional hardware and software company really take on a vendor who has built its cloud business from the ground up? My feeling is that this is going to be a very difficult transition for Oracle, regardless of its market clout, precisely because it has built its business up to now as being the anti-cloud. Time will tell if Oracle can compete, but my gut tells me this doomed to fail because Oracle while trying to move to the cloud still must protect its core software and hardware businesses — and it’s going to be tricky balancing those two competing requirements. Photo courtesy of Oracle OpenWorld San Francisco 2009. Used under Creative Commons License.